Positive Coaching Alliance places a great emphasis on the value of healthy relationships. Beyond some of the obvious connections between teammates and coaches, consider relationships between players and parents and players and classmates. Student-athletes usually enjoy high status in their school communities. That gives them the power to set certain social tones. Coaches can cultivate that sense of responsibility within their players, leading by example and devoting some practice or team meeting time to what constitutes a healthy relationship. 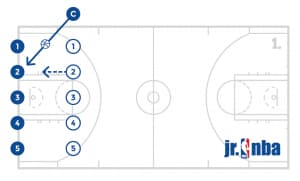 Have half the players partner up with one ball and line up on the corner of the baseline and sideline and the other half line up on the opposite corner of the baseline and sideline. The first pair in line will start with a dribbler and a defender in a stance with his back to the court. The offensive player will dribble side to side making moves to change directions at their discretion and the defender will slide back at angles to cut the offensive player off all the way down the court. Once the pair in front of them gets to the free throw line, the next group will begin. The players will work on pushing off their back foot, staying low having their hands out and moving quickly down the court as a defender. Depending on the players level, give some guidelines to the offensive players speed. 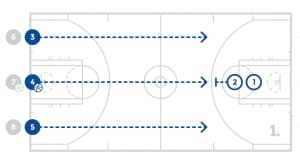 Have the players get a ball and start in a line on the baseline at the point where the lane line meets the baseline. 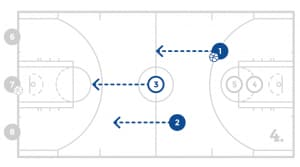 The first player up will take a dribble and then drop for a quick in and out move coming up the lane line. The player will do this 2 to 3 more times coming up the lane line until they pass the elbow. Once the player gets above the elbow, they will turn the corner back towards the basket and attack for a lay up. 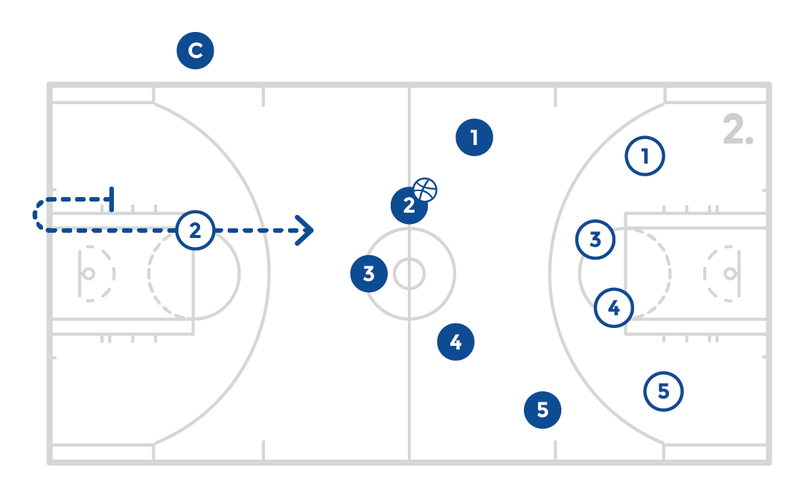 As soon as the player in front of them is halfway up the lane, the next player will start. Continue this process for the allotted reps and utilize multiple baskets if needed. The players will start in 1 line on the baseline under the basket. The first player will start without a ball and the next few players will have a ball. The first player will run to the top of the key and then make a straight line cut to the wing. 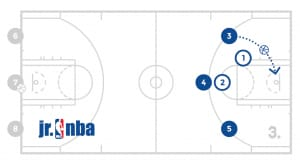 The next player in line will pass the ball to the player and the player will catch and shoot or use another designated shot. That player will get their rebound, give it to the next person without a ball in line and go to the back of the line. The player who passed the ball will run to the top of the key and make a straight line cut to the opposite side of the first player. The next person in line will pass to that player and continue the process by running up and cutting out to the opposite side as the person in front of them. 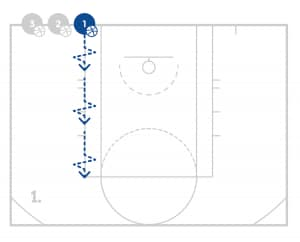 Continue this drill for the allotted amount of shots. 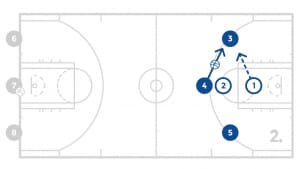 Have the players start in two lines on the wings with a ball and the first person start wide off the block with facing the line with the balls. 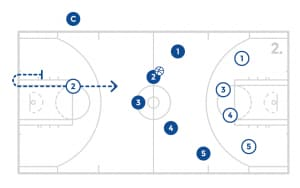 The player in line will pass the ball to the player facing them who will then make the move and get the rebound and go to the back of the line. The player who passed the ball will become the next shooter. The players should do the same process from the opposite side. 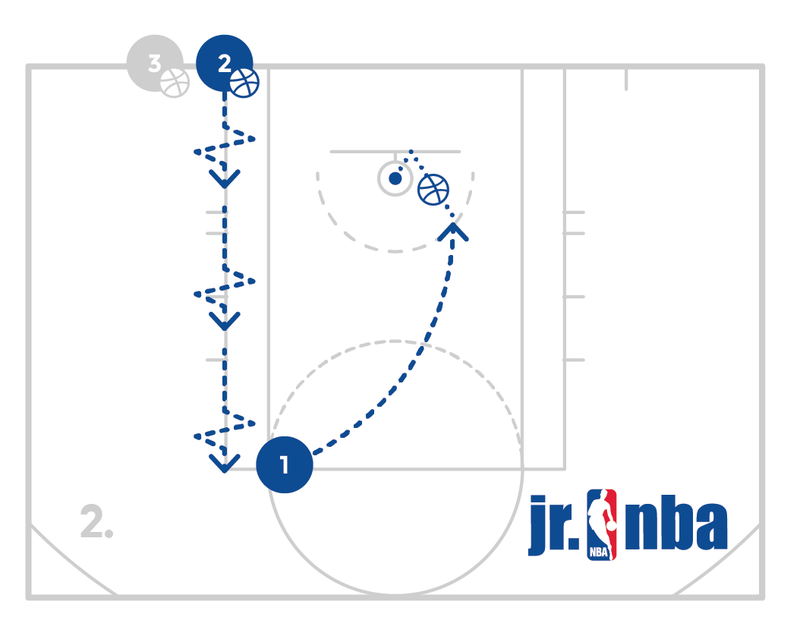 Reverse pivot rip for a lay up. Reverse pivot rip opposite for a lay up. Reverse Pivot straight into a jab and shot. Reverse pivot opposite straight into a jab and shot. Reverse pivot jab and attack opposite for a pull-up. Opposite foot reverse pivot jab and attack opposite for a pull-up. Reverse pivot jab and attack opposite for a move of choice. Opposite foot opposite foot reverse pivot jab and attack opposite for a move of choice. 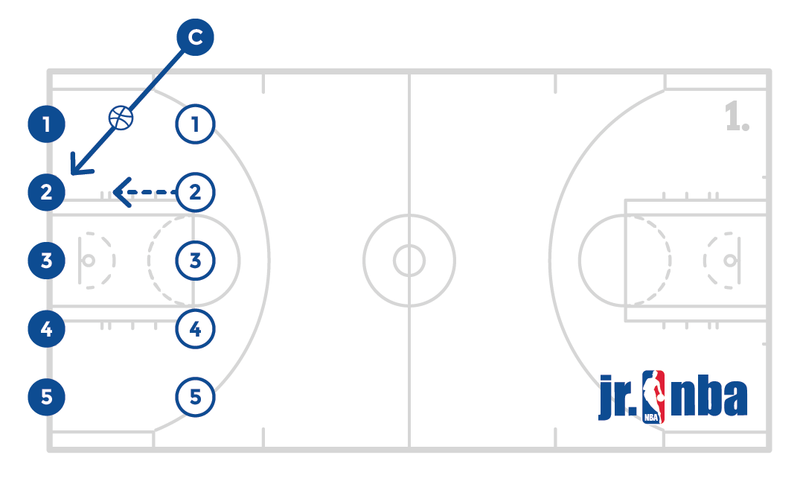 Have the players start in one line on the baseline where it meets the lane line. The first player in line will sprint to a closeout at the elbow. As soon as the player in front of them gets to the elbow, the next player will begin. From the elbow, the player will quickly defensive slide across the lane line. Once the player reaches the other elbow, they will backpedal to the baseline. The player will then get in the back of the line and continue for the allotted amount of time. 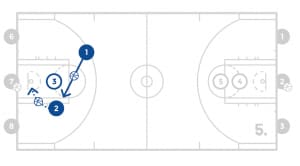 Start with 3 lines on the baseline (2 on the wing and 1 in the middle). The line in the middle will have basketballs. Place two players on the opposite end as defenders. 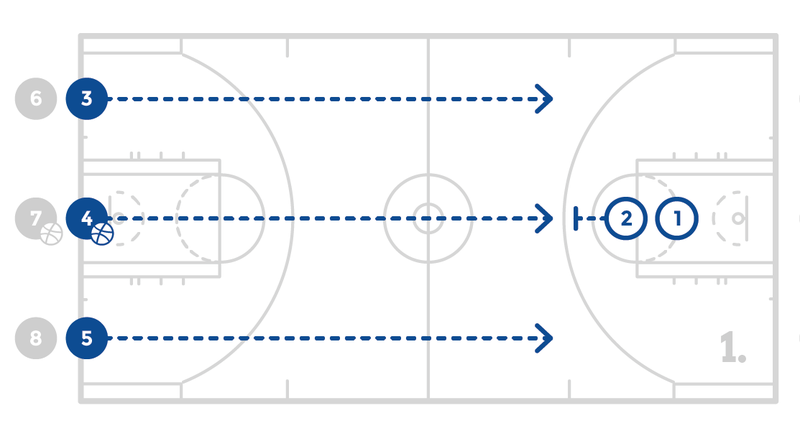 The first player in each of the 3 lines will go with the ball up the court and try to score in the 3 on 2 fast break. The offense is only allowed 1 shot. Whichever player takes the shot or turns the ball over will get back on defense. The other 2 offensive players will stay there and become the 2 new defenders. The two current defenders will bring the ball back down the court and try to score in the 2 on 1 fast break. This process will repeat with a new group coming on from the baseline and those who just finished going to the back of the lines. Work on spacing and making good decisions in transition. 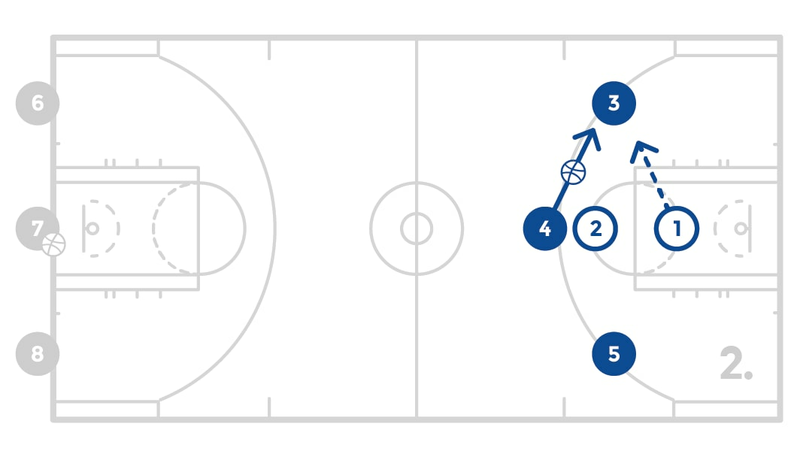 Have the post players start with a ball at one basket in a line. The first player will toss the ball off the backboard and grab the rebound and make a good outlet pass to the coach. 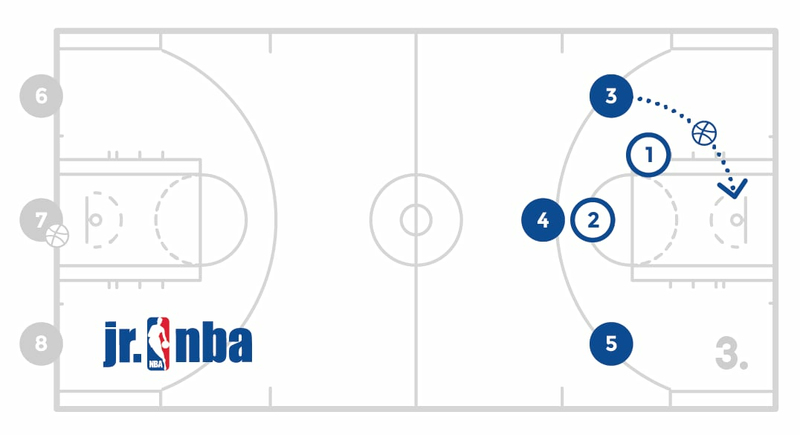 The player will run to half court and sprint back to the paint. 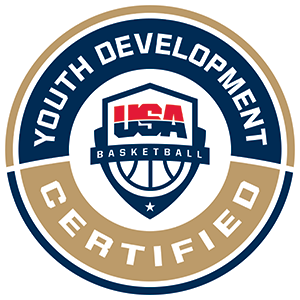 The next player in line will play defense in the paint while holding onto their basketball with 2 hands above their head. The offensive player will seal the defender, receive a pass from coach and finish. 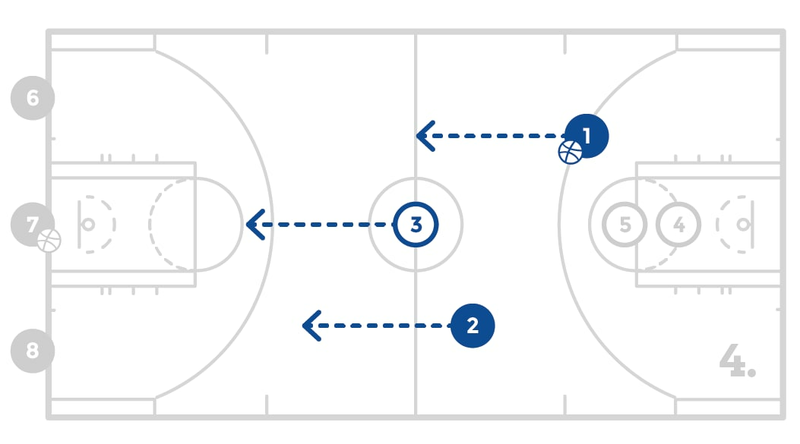 The next player in line who was the defender will then toss their ball off the backboard and begin the same process. Make sure to work on this from both sides of the court. 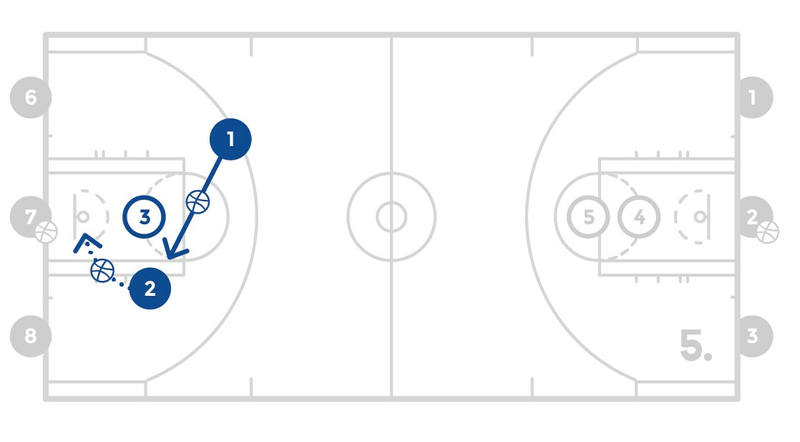 Have the guards start in two lines under the basket with the ball. The first player will toss their ball to coach and jump to touch the backboard. 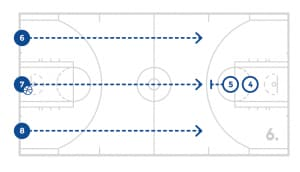 After touching the backboard the player will sprint out wide to touch the line where half court and the sideline meet and sprint back to the same side corner for a catch from coach and shoot the designated shot. Right after this, the player in the other line will begin the same process. Make sure the guards are running the floor wide and are ready to shoot on the catch. Have two lines at the top of the key with one line closer to the wing. Both lines will have a cone on the baseline directly in front of them. The coach will also be at the top with a basketball. 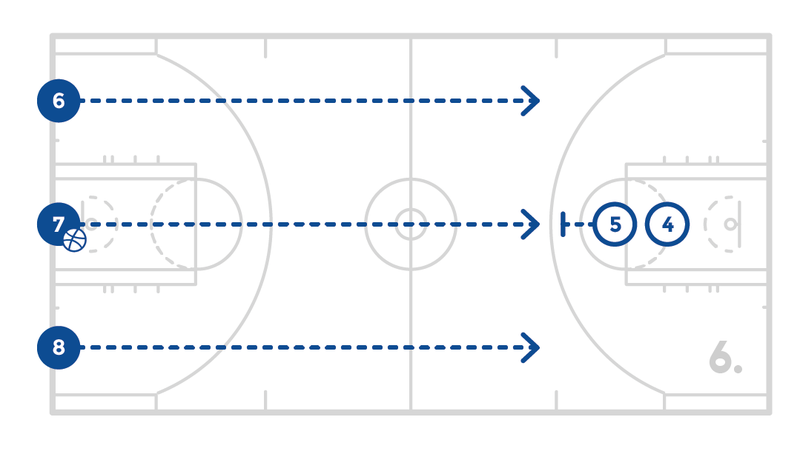 The first player in each line will have to sprint to the baseline and touch the cone in front of them and then sprint to the wing for 1 on 1. The player that was closest to the wing will be the offensive player and the other player will be defense. Play 1 on 1 with a maximum of 3 dribbles for each possession.